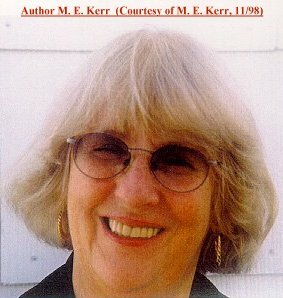 M. E. Kerr talks about personal favorites, what she’s working on currently and more! Read and enjoy! When you’re done, you can check out the other Interviews. Question: What are you working on right now? Can you give us a hint? or favorites among your work as M. E. Kerr and Mary James? Q: If you weren’t a writer, in what other profession might you be interested? Q: What was your least favorite subject in school? Q: What are you reading right now? Do you read a lot? Do you prefer children’s and young adult literature or adult literature or perhaps a mix? A: I am reading Philip Roth’s new book. Just finished the Kingsolver novel and Ethan Canin’s Kings and Planets. Yes, I read a lot. I prefer adult novels though I like Cormier, Lypsite and Han Nolan. Q: Do you think there’s a possibility of your ever having a female protagonist again? Maybe in a Mary James book? I know you have stated preferring to have male protagonists since you learned that female readers will read either voice while male readers prefer a male narrator/lead character. Evie – and the novel I am working on is truly about a girl. Q: Is your school psychologist in Shoebag Returns modeled on a real person? I’m always sensitive about how school psychologists and counselors are portrayed. Your portrayal was a little goofy (which is not offensive), and he didn’t keep his client’s confidence (he told her teacher what she said). But he did get Greg to visit the school and that was definitely a positive thing. Also he seemed so eager to psychoanalyze her which is a stereotype. But I did appreciate that you were considering, deliberately or not, children’s tendency to make fun of adults to make them more accessible and less intimidating. – but most authority figures in my books are wanting. As a kid, I was not beholden to them. Never was psychoanalyzed myself – or “therapized” – but I have several friends who are psychiatrists – MD’s. Maybe I am spoofing them. Q: I’ve read that your experience with the tv production of “Dinky Hocker Shoots Smack” turned you off that medium. Still, your stories seem easily pictured visually, such as Hello, I Lied and all of your Mary James’ books. Do you think you might give tv or movies another try? mom was a lesbian. It was a Meaker, adult, Little Brown [publishers]. Q: What is the best and/or favorite piece of advice you’ve received? A: You’ll never do it any younger. A: Read. Know the profession. A: Thanks to you, too.